Here it is December and I have all these loose ends, tattoos I photographed in the summer and, for some reason or other, never wrote about. Robbie explained that the red balloon is a family reminder about his grandmother, and that in addition to his own tattoo, his mother, brother, cousin and aunt all have tattoos that contain a red balloon, as a nod to the family matriarch. 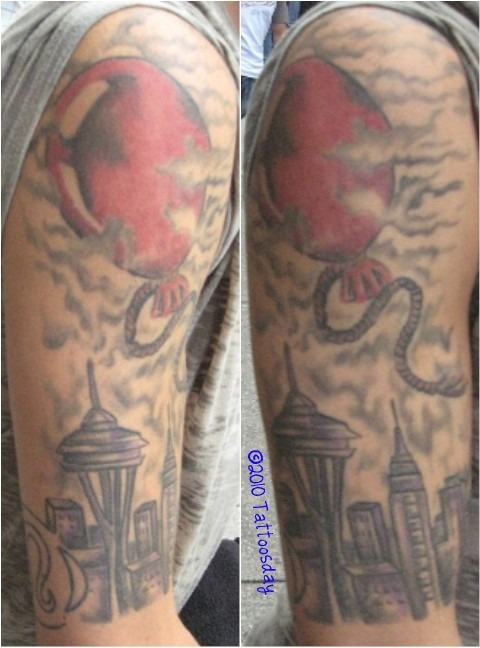 The skyline depicted is punctuated by the Space Needle, Seattle's most recognizable landmark. Robbie is from Washington State, and the addition of this famous structure to a metropolitan cluster of buildings, which includes a scaled-down replica of the Empire State Building to its right, is a nod to his home town, while also recognizing New York City, his current home. Robbie credited the tattoo to Liz at Addiction NYC, although he noted she tattoos somewhere out on Long Island now. Thanks to Robbie for sharing his tattoo with us here on Tattoosday!